André was born the 3rd of May 1967 in Düsseldorf. He is married and has two sons. 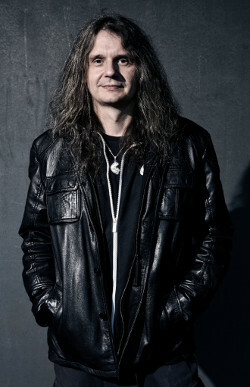 He is a childhood friend of Hansi and like him, original member of Blind Guardian. He is a very sociable person, he always loves to meet fans and discuss with them after the group's concerts. Among his favorite books we find The Silmarillion and The Lord Of The Rings by J.R.R. Tolkien, he also dreams of creating an orchestral rock opera for the last one. Like Hansi, he prefers spicy food. His favorite dish is the Mexicans Fajitas. The Pina Colada is his favorite drink. He has no favorite color, special things need special colours. His favorite movie is Sopranos. The 23 Tintin comic books are his favorite reading. André is a big fan of video games, including World of Warcraft and Baldur's Gate 2. Among his favorite bands, we find Ozzy Osbourne, U2, The Rolling Stones, Judas Priest. Golden Age Of The Grotesque by Marilyn Manson is his favorite album. His hobbies are computer and video games. Cats are the animals he prefers. It's his family that makes him happier. He supports also the Bayern Munich and the German team. André dream again and again to visit the USA. Las Vegas is the place that has most impressed him.